Who doesn’t love cake? The rich blend of sweet cake and creamy frosting is sure to make you smile. Type: Birthday cake Soluble Flavoring. Ingredients: Natural and Artificial Flavoring, Ethanol and Propylene Glycol. USP Kosher Grade Flavoring. Usage Rate: 15-20% for E-use. 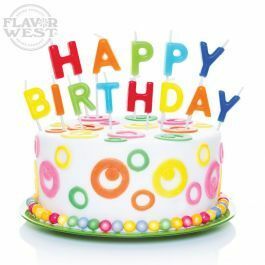 Flavor suitability: Suitable cakes, desserts, pastries and more. Specific Gravity: 1.06 No Refunds on Flavoring.